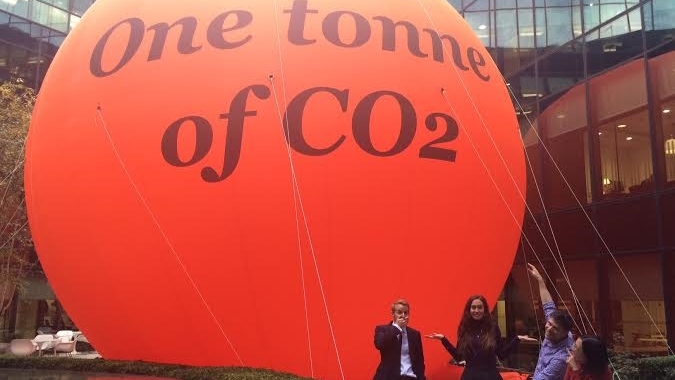 For six years, we have been working with organisations to show that if you can see carbon dioxide you do something about it. Recently we have been supporting several organisations in their preparation for COP21. In our experience, the informed engagement of people everywhere supports the actions of our leaders and decision makers during and after these conferences. The impact of a team of people, a community, or a nation who ‘get it’ means that the agreements reached at COP21 actually become real. For a COP21 event we created short animations to show carbon reduction targets in a selection of global cities (see video here). We have helped with staff engagement at a number of companies including Kingfisher PLC. Our design team have produced films for ECMWF to show how the Copernicus climate data services also play a critical role in enabling change (read more here). So whilst this is about showing the climate and carbon challenges it is also about visualising success and paths we can follow to meet them. We created visuals to celebrate the Montreal Protocol earlier this year. Ozone protection efforts stemming from the Montreal Protocol have significantly contributed to the mitigation of climate change by preventing more than 135 billion tonnes of carbon dioxide equivalent emissions going into the atmosphere (read more here). There is a lot resting on COP21 but then the future starts. When you can see the difference working together makes, it can help you keep the faith in each other – the world over. If you can see it, you can do it. Together.